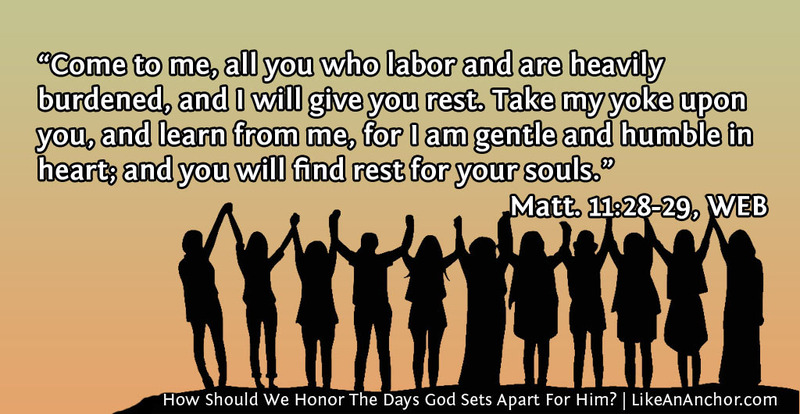 How Should We Honor The Days God Sets Apart For Him? Practicing righteousness. Learning to love. Developing the mind of God. Following Christ. Those are all essentials of the Christian life, and there are many “tools” God has given us to help us succeed in these goals. These include prayer, Bible reading and study, the Holy Spirit inside us, and fasting. 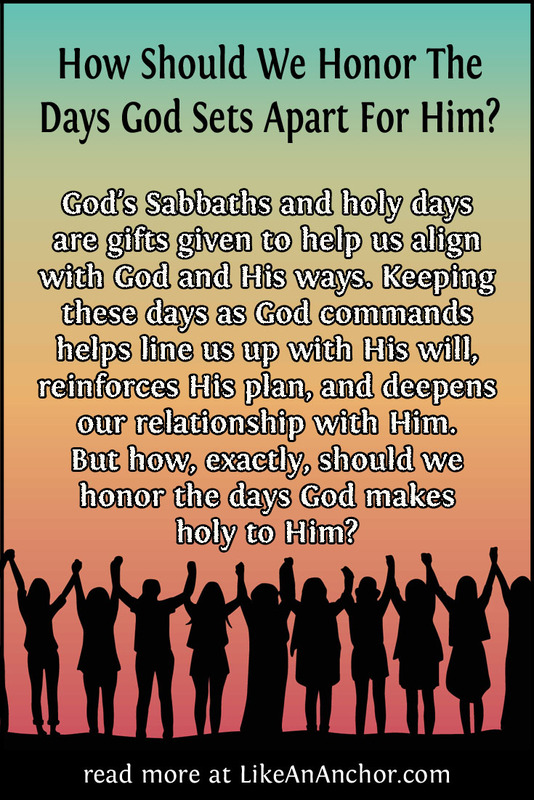 God’s Sabbaths and holy days are also vital, and often overlooked, gifts given to help us align with God and His ways. Keeping these days as God commanded helps line us up with His will, reinforces His plan, and deepens our relationship with Him. Just as responding to an invitation to get together with your physical family lets you build relationships with them, so does responding to our heavenly Father’s invitations help us build relationships with Him, our Bridegroom, and the other children in His family. For many Christians, keeping God’s holy days is a foreign concept because they’ve been (incorrectly) told “that’s just a Jewish/Old Testament thing. But when you start to recognize there’s lasting value in the days God calls holy to Him, you come up against the question, How do you keep the Sabbaths in a way that honors God? Even if you have been keeping these days for a while, you know this isn’t always an easy questions to answer. There are certain rules and guidelines in scripture, but they don’t answer all our questions. Plus, knowing what to do, and what not to do, in keeping the holy days is about more than a list of rules. It’s about honoring God’s instructions on how to come before Him. So let’s take a look at what God says to do for these days and how we can obey those commands in the spirit and from our hearts. The weekly Sabbath and all seven holy days include the instruction to stop working. “You shall do no kind of work” and “you shall do no regular work” are oft-repeated phrases when the Bible talks about God’s holy days. This is a very serious command, and working on the Sabbath day was one of the death-penalty sins under the Law (Ex. 31:14). Thankfully this is not enforced literally any more and we’re given opportunities to repent and change because we’re covered by the blood of Jesus Christ, but this does show us how serious God takes the issue of Sabbath keeping. While God does mean what He says — you’re supposed to stop working on His holy days — He also doesn’t want that command taken to an absurd extreme. For example, because harvesting your field on the Sabbath would be work, the Pharisees got their knickers in a bunch over Jesus’ disciples plucking a few handfuls of grain and eating it on the Sabbath. Jesus, who is also the Word of God who’d delivered the Sabbath commands to ancient Israel, didn’t have a problem with that, though. The “Lord of the Sabbath” knew what the purpose of Sabbath was and that the Pharisees had missed the point (Matt. 12:1-12). We’re not to get so distracted by the formality that we lose the purpose of the Sabbath. God didn’t intend it as a burden, but as a gift. He is inviting us to share in His rest. This is a deeper rest than sleeping in late or laying on the couch watching Netflix. The rest that God offers is tranquility, a settled calm, and a quiet place to live in (in Hebrew, it’s mnuchah [Strong’s number H4496] and Greek kataposis [G2663]). Keeping the Sabbath gives us a chance to experience God’s rest in a way that’s more complete than during the other days of the week. It also sets the tone for every other day of our lives by reminding us of God’s perspective on things and the true rest available in Him (Heb. 3:10-4:11). Offerings were an integral part of every Sabbath and holy day. It’s amazing what detailed lists of offerings are given for each day (there are too many references to link them all, but if you want to check them out you can start in Lev. 23). Some of these were blood sacrifices for sin, which are now fulfilled by Christ’s death as the Lamb of God. But there were also other offerings, which are fulfilled by us today in different ways. Over and over again the children of Israel (and also us as covenant-inheritors and spiritual Israel) are told to keep (H8104 shamar) and observe (H6213 asah) God’s sabbaths and holy days. To observe something is “an ethical response to God which goes beyond mere mental abstraction and which is translatable into obedience which is evidenced in demonstrable acts” (TWOT entry 1708). In other words, Sabbath isn’t just a state of mind. Keeping the Sabbath has to be done God’s way — from the heart as well as in the specific outward signs that He commands. Most of God’s holy days are joyful celebrations. There are only three exceptions. The Day of Atonement (Yom Kippur) is described as a somber, serious day (Lev. 23:26-32). The Last Day of Unleavened Bread (Chag haMatzot) and the 8th day following the Feast of Tabernacles (Sukkot) are also described as solemn, restrained observances (click here to read about the different Hebrew words used to describe each holy day). Other than that, the Sabbaths are marked by delight, rejoicing, and praise. God’s feast days are times of song, joyful shouts, music, and trumpet blasts (Ps. 81:1-4). They’re times when we give thanks, sing praise, play musical instruments, and proclaim Yahweh’s goodness (Ps. 92, a song for the Sabbath day). We’re told to call the Sabbath a delight, and rejoicing is a command for the Feast of Tabernacles (Is. 58:13; Deut. 16:14). Also, the word for “keep a feast” that’s used in reference to the three festival seasons of Unleavened Bread, Pentecost, and Tabernacles can even mean “to dance” (H2287 chagag). I’ll be honest, fulfillment of this part of Sabbath observance is pretty hit-or-miss in the churches I’ve been to. Some do the things that are talked about in these verses, while others feel like going to a funeral service. I get that not everyone feels comfortable with exuberant praise, but I wish they’d stop acting scared/judgmental of those who do want to follow these commands. God created us all with unique personalities, and there has to be room in His church for all of us to follow His commands and express our delight in Him as we’re led by the Spirit. This instruction is given after Aaron’s two sons were killed by God for doing something in the Lord’s sanctuary which was contrary to His commands. A similar thing happened in the New Testament when Ananias and Sapphira were struck down for lying to the Spirit of the Lord (Acts 5:1-11). Cases like this are very rare in scripture, but they eloquently demonstrate just how serious God views something that disrespects His holiness. When we “observe the Sabbath day, to keep it holy as Yahweh your God commanded you,” we are respecting the Lord’s holiness and His authority to make something holy (Deut. 5;12, WEB). 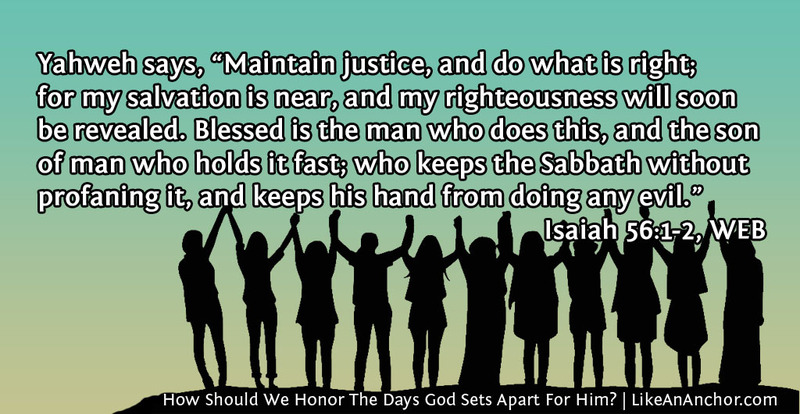 We must keep God’s Sabbaths with a profound regard for the One who sanctified them. Unless we want to profane God, we need to make a distinction between the holy and the common and continue to keep His sabbaths (Ezk. 22:26). Honoring what He calls holy is part of becoming holy ourselves. What Are God’s Holy Days And Why Would We Care?